my blog Don't Sit On the Side Lines. Don’t Sit On the Side Lines. 100’s of shows need fresh music every week and so many styles are needed. 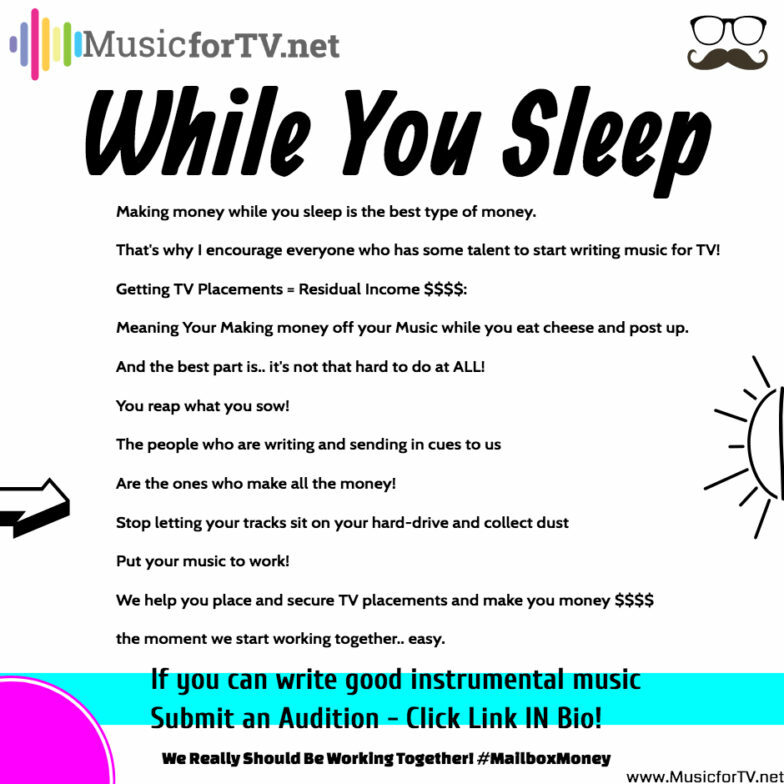 We have the connections to get your music placed in tons TV shows. Of course it has to be a great track and fit the scene. So guys, for maximum results, set weekly goals and deliver quality music! This will ensure placements. Honestly, it’s not that hard. If you’ve been accepted then we know you can do this and know you will be happy you did. Another thing, please don’t sit back and think your 1-3 cues you sent in will make you millions. That is not the case here. The people who are writing regularly and sending us music are the ones making all the money and placements. SO! Let’s go get it this week! No Excuses! Once you join our team, we start using our personal connections to place and secure TV placements on your behalf. It’s that simple. Join our team! You have to be a client to work on our amazing opportunities. If you are not a client, click this link to learn more about our company and how we can help! Keep writing! TV shows don’t stop needing music just because summer is here. Many of our opportunities are ON-Going for dozens of shows. So check our Current Opportunities page and set weekly goals! We recommend sending at least two quality 90 second instrumentals with variations/alt mixes a week. The more the merrier though. For best results – stay consistent, provide quality and write regularly. If you have not been consistant, don’t worry! Today is the best day to jump back on board and get to work! 100’s of shows need fresh music every week. Also don’t be bashful. Give me or James a call! We’d love to chat or answer any questions you may have! Overall MFTV is happy to represent each and everyone of you guys! Keep up the good work. Hope everyone has a great week!